Editor’s note: In its nine decades of existence, the Greek Archdiocese has been served by only six primates — Alexander, Athenagoras, Michael, Iakovos, Spyridon, and Demetrios. And 55 of those years are covered by just two men, Athenagoras and Iakovos. That pair looms large over American Orthodoxy, and an argument can be made that either one is the most influential person in our history. Sandwiched in between those two, the nine-year tenure of Archbishop Michael Konstantinides is often forgotten. Outside of Greek circles, his name is almost totally unknown. Yet Archbishop Michael provided an important bridge between Athenagoras and Iakovos, and his own influence on American Orthodox history was substantial. To help fill in this gap in our historical understanding, SOCHA has received permission from the Greek Archdiocese to reprint a series of articles on the life and work of Archbishop Michael. These articles overlap one another to some degree, but they provide a helpful variety of perspectives. The first of these articles, below, was written by the late Bishop George Papaioannou of New Jersey and originally published in the Hellenic Chronicle (7/11/1996). Bishop George was an historian of Greek Orthodoxy in America, and he was the first widower to be consecrated a bishop in the Greek Archdiocese. He unexpectedly died just six months after his enthronement, on November 22, 1999. Among the first and most difficult tasks of Ecumenical Patriarch Athenagoras as spiritual leader of World Orthodoxy was to select an Archbishop for the Greek Orthodox Archdiocese of North and South America, a replacement for himself. 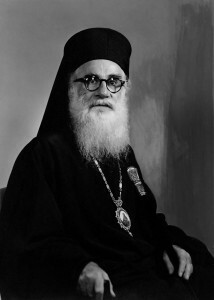 On October 11, 1949, Patriarch Athenagoras, in a telegram to Bishop Germanos of Nyssa, locum tenens of the Archdiocese, announced to the Greek American faithful that the Holy Synod, under the guidance of the Holy Spirit, had elected as legal and canonical Archbishop, Metropolitan Michael of Corinth. Like his predecessor, Michael resembled a biblical personality, imposing yet gentle, sweet and joyful. Like Athenagoras, he was a graduate of the Theological School of Halki but unlike him, Michael had served as a priest in London, was fluent in English, and had pursued theological studies abroad. Corinth enjoyed days of spiritual exaltation during the tenure of Michael in that city. He was a very spiritual man, in the truest sense of the word, unshakable in his dedication to his calling. Archbishop Michael arrived in New York on December 15, 1949 to take up the reins of the Greek American Church. In contrast to the deplorable conditions that Athenagoras had found when he assumed his duties in 1930, the conditions awaiting Michael were very favorable. His Greek American flock was in harmony and peace and there was prosperity throughout the land. These favorable conditions, however, did not mean that the ministry of Michael was to be an easy one. On the contrary, the beginning of Michael’s tenure coincided with the growing pains, the hopes, the dreams and the expectations of a community in transition from the old guard to the new, from the generation of the pioneer immigrants to the American-born generation. He entered the picture and devoted all his energy to his people. Michael’s personality was different from that of Athenagoras, who was a diplomat churchman, Michael was an intellectual pietist, he emphasized matters of piety, discipline and sacramental life, especially spiritual and sacramental reawakening. Michael dealt admirably with the two most pressing problems facing the Greek Orthodox community in the United States: religious education and youth. It was Michael who first allowed a limited use of English in the church. It all began with the teaching of religion in Sunday School. Michael’s predecessor had refused to yield to the pleas of the native born generation and allow the use of English in their teaching of the faith. Although Michael was no less a lover of Greek culture and language than Athenagoras, his deep religious convictions made him recognize the need for the use of English in teaching the Faith. At the Tenth Clergy-Laity Congress in St. Louis in 1950, he painfully but most eloquently articulated. change that would allow the use of English in Sunday Schools. This innovation was followed by the preaching of the sermon in both Greek and English and the use of English in the sacraments, especially in the western states. Michael’s greatest contribution, however, was in dealing with the second most pressing problem of the Archdiocese, the youth. He labored more than anyone else to advance the rights of the youth in the church. In April 1951, Archbishop Michael announced through an encyclical letter to the parishes that a national youth conference was to be held in Chicago and asked for their support. The Conference was held as scheduled and heralded as a new era in the Orthodox Church in the United States. The national youth organization became a reality: its name, “GOYA,” was destined to capture the imagination and fulfill the dreams of tens of thousands of young people throughout the American Continent. Michael took personal command of the crusade for GOYA’s acceptance as an inseparable part of our communities. A churchman of ecumenical dimensions, he advanced the cause of Christian unity; in 1954 he was elected and served as president of the World Council of Churches. Archbishop Michael’s tenure as Primate of the Greek Archdiocese of North and South America was cut short by his untimely death in July of 1958, depriving Orthodoxy of a learned Bishop who was vastly informed, had a wonderfully retentive memory, was fluent in many languages, was an eloquent orator and a brilliant writer. Michael had many talents and virtues. The genius of the man, however. was his spirituality. He was a spiritual man with a deep devotion to his sacred mission of promulgating the Faith in the United States, a man who was loved and respected for his exemplary life and for having personified the motto of his beloved GOYA, Live Your Orthodox Faith. This article was written by the late Bishop George Papaioannou of New Jersey. Copyright Greek Orthodox Archdiocese of America and used with permission.